We have chosen a rich but subtle antique brocade fabric, lined with a satiny polyester of the softest sheen with matching 4-inch chainette fringe. We offer numerous brocade, embroidery, linings and fringe color combinations. Click Here for a chart of fabric colors. 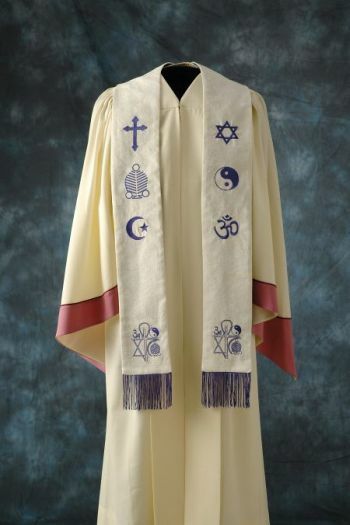 You can customize your stole in many ways including adding additional symbols, replacing existing symbols with other ones, or rearranging the symbols -- let your creativity run wild and come up with your own arrangement! We can digitize and add your custom logo to any embroidery order as well. Just call our office toll-free at 1-877-ONENESS for details! For a chart of fabric colors, Click Here. Allow 2 to 3 weeks for delivery. Rush orders are available if time is in short supply!